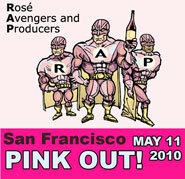 Rosé Avengers & Producers and Butterfly restaurant host the 6th Annual PINK OUT! SF Rosé Celebration on Tuesday, May 11th from 6:30pm to 8:30pm. The celebration features an extensive walk-around tasting of 40 plus classic still and sparkling rosés from throughout the world with many of the winemakers in attendance.